I’m currently reading Terry Reilly’s entertaining and informative The Green Above The Red (which I’ll review in more detail at some point next week) and, in doing so, I came across the text of the famous letter written by a number of the Mayo team to the County Board in November 1947, the aim of which was to do something to alter the direction the county’s football fortunes were heading in at that time. The catalyst for the famous exocet was a league match down in Tralee on the 9th of November 1947, in which Mayo somehow managed to hold that year’s All-Ireland finalists Kerry to a draw, despite that fact that County Secretary Finn Mongey (Eamonn’s brother) and a car driver had to be pressed into service on the day to make up a full team. A number of players felt that this was the last straw and that a few home truths needed to be said in the game’s aftermath. 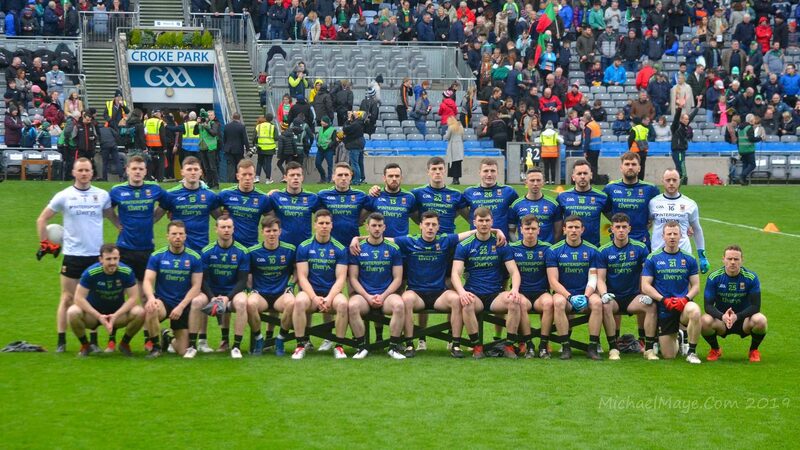 A Chairde – It is some time since we decided that a letter in this strain should be written in an effort to remedy a state of affairs which, in our opinion, is detrimental to football in Mayo. Year after year we have seen the County Board bring to nought the hours of training which we have put in, but yet, believing it was outside our sphere as players, we have desisted from drawing your attention to the matter. Events in Tralee last Sunday have banished our indecision, however, and we feel the time has come when something must be done before football disappears completely in Mayo – unwept, unhonoured and unsung. Since 1939, Mayo football has struck a very lean patch and only now is it rounding the corner. The displays given by the team against Kildare, Antrim and Kerry show that with a little help and encouragement – along the right lines – the present batch of footballers is in the top line today. And, furthermore, we think we were in the same grade in 1946 when we played the disputed game with Roscommon. The collapse of the replay and the repetition of the debacle in this year’s championship we blame on the total indifference of the County Board. For weeks before the championship the Dublin players clamoured for matches with other counties, not for their own sake – they would have too much football in Dublin – but for the sake of the county and with the view of giving the members of the team an opportunity of playing together and of perfecting their combination. But the only matches were (1) against a makeshift Galway team and (2) against Longford when some of the players had prior engagements. Not only did these matches fail in their primary object, i.e. as a conclusive try-out for the team but they also failed in their secondary object. i.e. as an informative aid to the selectors in making their final choice, for the simple reason that there were very few selectors present at either game. It seems that when a Mayo team is selected the selectors are permitted to depart home and never see the results of their work. They never go near an intercounty match, either at their own or the Co. Board’s expense unless it is played in their own back garden. We ask you if this is the correct attitude to adopt? Can such a selection committee be efficient and/or effective? Nor has that indifference vanished yet as can be seen from the fact that only one member of the County Board – and the most maligned member at that – travelled to Tralee for the recent League match. Where were the others? Did they think the result of the match a foregone conclusion, or are they solely a “victory” County Board? Perhaps if they had been present the result might have been a foregone conclusion! However, they weren’t there, and the Secretary and four players selected, in approximately ten minutes, a team which was not afraid of Kerry, but which went out and justified their confidence in themselves as footballers. They may have missed the sermons and the fatherly advice and the old reminder that they had the confidence (?) of the Co. Board behind them! But the result of the match should answer that query. That the material is there has now been proved, but that it needs better management has likewise been proved. For instance, what lesson has the County Board learned from the Tralee game? Is it indicative of good management that one member is expected to bring back a full report on the prowess of each player, while the same member, while in Tralee, was meeting Kerry officials, making arrangements about hotel accommodation, meals etc., supplying bandages, elastoplast, and embrocation, presiding at a selection meeting, massaging the team before they went on the field, towelling and rubbing and supplying badly-needed refreshments at half-time, and even then at the team’s request togging out as a sub? But more credit to the man in question – he did all that and something more when, in the first quarter he made two match-winning switches, a practice completely foreign to Mayo GAA officials. It is an unselfish efficiency and spirit such as this that a Co. Board wants, and not until this is forthcoming will football again flourish in Mayo. If we were asked to explain why recent Mayo selections have been unsuccessful we should say that, in the first place, the selection committee is too unwieldy to be effective. The present committee of from sixteen to twenty members should be slashed to approximately five, as big numbers tend to retard progress; secondly, the players don’t get sufficient training as a team. Challenge games should (and can easily) be arranged with other counties so that (a) a team could be selected and (b) having been selected, that it could be trained as a unit. Thirdly, we feel that too much time and energy has been spent on petty squabbles existing among officials, but not among the players. We, as representatives of the four divisions within Mayo, ask you to put aside petty jealousies and favouritism, to get together, stay together and pull together, to pick a team, not of “historic” players, nor of “friendly” or “kindred” players, but a team made up of the best 15 players available. 1948 didn’t, in the event, turn out to be Mayo’s year. Neither did 1949. But on the 24th of September, 1950, Sean Flanagan and his team finally got their hands on the Sam Maguire Cup after beating Louth in that year’s final on a scoreline of 2-5 to 1-6 and twelve months later, they clinched back-to-back All-Irelands with the 2-8 to 0-9 defeat of Meath. How much of the credit for this success can be attributed to the letter of November 1947 must, of course, remain a matter for conjecture but I think it’s fair to conclude that it certainly proved to be no impediment to the team’s subsequent advancement. The lesson to be learned from the delivery of such a single-minded and well articulated vision in a time of trouble is obvious for where we find ourselves now at the fag end of 2010. It’s a lesson that isn’t confined to the narrow world of Mayo GAA either. Excellent piece WJ and food for thought. 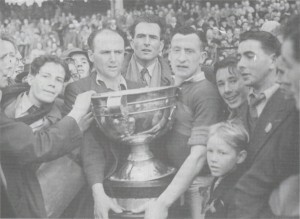 The bald man holding the cup with Flanagan is Finn Mongey, brother of Eamon Mongey. See the startled look on his face. Not joy, but almost unbelieving from that November Sunday in 1947 below in Tralee. Between 1948-51 Mayo won 4 consecutive Connacht titles, appered in 3 Senior All Irelands, winning 2 and added a National League for good measure. The one they lost v Cavan, it is accepted that they were robbed , 4 minutes of time shaved off and New York born, Kiltimagh parented Mick Higgins charged down Padraig Carneys 14 yard free in front of the posts at the death. Ironic a man with Mayo blood doing such damage! The Mongeys were exceptional men. Eamon never forgot what the Board didnt do. In the Western People many years later he stated that for as long as he could recall the county board did nothing to help the team except hinder its progress. Finn, the man with cup was that sub below in Tralee in November 1947, he was the bandage man, the massuer, the link man with the Kerry crowd, the grub organizor and selector! Keith Duggan in the Irish Times once wrote about those men, he just wanted to know what it was about them men that made them swim against the tide of mediocrity. I disagrred with Duggan then, I now accept he is right. Hopefully the future will see us all swimming in the one direction. P.S The young man on Mongeys right shoulder is a well known writer for the Irish Press and Irish Times in later years ,Michael Finlan. A book worth reading about that era and who has captured the raw emotion of the day is John Healys “Healy, Reporter”. Its a classic and worth robbing. Tom Langan gave Healy a fist in the gob before an All Ireland final because he wasnt impressed with Johns opinions. Now thats passion and balls. Healy and Langan had it. lets get that back. I think that letter shows what an outstanding, professional bunch of players the Mayo team of that era were….That was 1947 like!! I’m one of Finn Mongey’s daughters. The eldest of my three sons forwarded me this piece about their grandfather of whom they are immensely proud. Although born and living in the UK, Owen, Neil & Myles have an amazing physical resemblance to him as well as his wonderful can-do attitude. He was a warm and constant grandfather to them. They still talk about my father’s funeral cortege with Garda motorcycle outriders in 1999 when a wonderful and heart warming number of GAA & RNLI friends came to pay their tributes. Suaimhneas De da anam.